Any business that has more than one employee must have a payroll system. Paying employees consistently and with no delays not only impacts their morale, but it also reflects the company’s financial stability. Moreover, it is a requirement for compliance with federal and state laws. While this is a complex process, having an efficient system helps streamline and centralize the payroll method. But first, let’s discuss what is payroll management process? In essence, the payroll management process refers to the administration of an employee’s financial records which includes the salaries, wages, bonuses, deductions, and net pay. These records must be maintained and kept by the employer for federal requirements, especially when it pertains to payroll taxes such as Income Tax Withholding Records, Social Security (FICA) Records, and Federal Unemployment Tax (FUTA) Records. Morale of employees. Late payrolls make employees question the business’ financial integrity. If they feel their job is not stable and secure, they may underperform which decreases the workforce productivity and quality of your organization. This factor also includes their net worth and total compensation with bonuses and benefits. Lower tax bills. Appropriately and consistently accomplished payroll minimizes state and federal taxes. On the other hand, doing it inaccurately can result in hefty fines. Hence, ensure the proper amount of FICA taxes is withheld from each payroll and secure your employees fill out their W-4 forms correctly. No matter the size of the organization, managing the payroll system is crucial. Those with fewer employees can use a one-write system. New business owners who are not knowledgeable in the process may find the procedure challenging because of the various federal and state laws requirements that must be complied with. Hence, some businesses outsource their payroll services to ensure compliance with all applicable laws. Those who prefer to do it on their own, however, purchase an automated payroll system because it is cost-efficient and time-saving. For more information on what is the best payroll software for small business check out our detailed guide to top solutions. 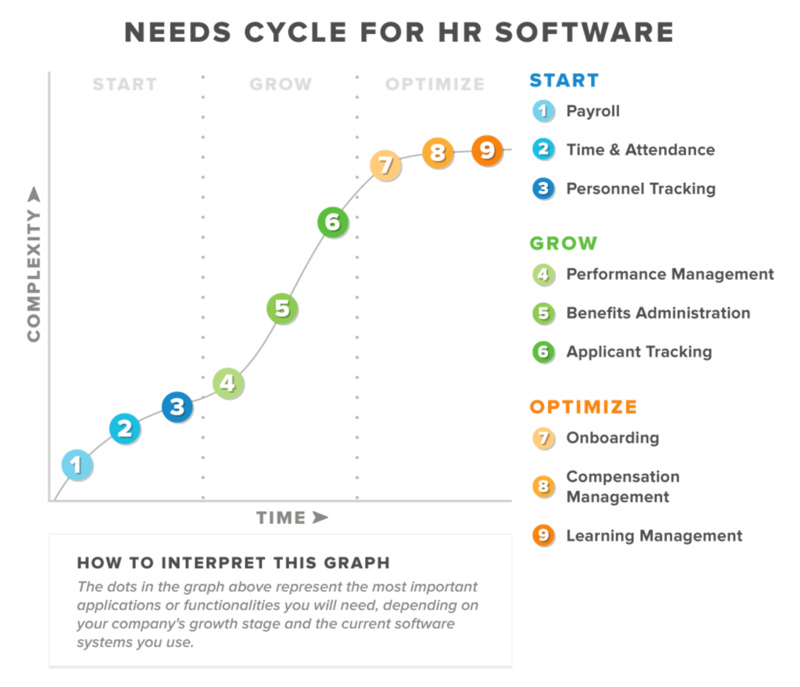 Payroll software is one of the first HR software solutions small business owners must implement for their growth as it covers the basics for future HR processes, according to a survey of software buyer interactions. Systems for “time and attendance” and “personal tracking” come next, respectively. Forty-two percent of payroll software buyers are SMEs with 1-50 employees as they understand the potential roadblocks it eliminates such as inaccurate paychecks and vexed tax authorities. It is time-saving. One in every three businesses spends 80 hours on managing federal taxes including employment taxes. This is equivalent to two weeks’ worth of full-time work. Calculating the payroll may seem as straightforward as adding up a number of hours worked with the employee’s rate. However, taking into account factors such as vacation leaves, overtime, and benefits makes it complicated. Moreover, the federal taxes with its own requirements have to be applied in every payroll. While you still have to input specific variables, a payroll software automates and optimizes the entire process that saves a significant amount of time compared to manually doing all the calculations. Repeating payroll tasks are also saved in the system so you won’t have to create a new format again and again manually. It maintains payroll information. Federal, state, and local laws must be implemented when paying employees along with their compensation and deductions. This information must be kept for each employee for accuracy in computation. Many payroll packages have customizable payroll modules that maintain these data. It eliminates the need for consulting various data sources because all information is compiled in one place. They also offer features that optimize pay periods, the method of payment (such as direct deposit and manual checks, among others), benefit deductions, and the work requirements for employees. This allows owners and managers to create a system that optimizes auditing and guarantees the employees understand the company’s policies. It is cost-effective. Most payroll systems are cloud-based solutions hence you will only have to subscribe to the service in order to use it. Additionally, its upgrades are provided automatically in most cases. There is no need for investing in hardware such as servers and physical software packages. Without outsourcing or hiring more employees to handle the payroll management, it can save you money in the long run. It is secure. The security standards of a payroll software are solid. Employee data is kept confidential which can be implemented by ensuring tight controls. This means specific access codes and administrative rights are only provided to the appropriate users to gain entry in the system. Meanwhile, employees can also log in and track their hours, leave allowances, payroll deductions, fringe balances, and other benefits in their payroll profile. This boosts their morale and reduces the work of payroll administrators. It optimizes the process. Repeating payroll tasks lead to boredom and can result in human errors. Computers mitigate this issue and guarantee payment information is accurate. Moreover, these data are archived in the online database. If your computer breaks down you won’t risk losing all your data because you can still access it on other platforms as long as you have your login details. Business owners and managers get a graph financial data to help them with forecasting payroll expenses. This includes calculating potential salary increase and determining how it can impact your company’s financial status to make necessary adjustments. If you’d like to learn more about how much do payroll companies charge check out our other guide on that topic. Gusto. This online payroll service suits small businesses. Its users find it saves them time up to 75% for processing payrolls. It is easy to setup with instructions in plain English that’s helpful for users with less technical knowledge. Xero. A full-service accounting platform that takes care of invoicing, inventory, bank connections, and bank reconciliation, among others. Its payroll automation services is an integral part of their productivity kit. ADP Workforce Now. It is a compact HR management tool with a suite of solutions for the payroll management of midsize businesses. One of its unique features is being fully COBRA-compliant. Dayforce HCM. This payroll suite offers a rich set of features that take care of payrolls, taxes, and workforce management. It has effective multi-tasking capabilities and HR tools. Wave. It is considered one of the most compact payroll software suites that is available for free with payroll automation and expense management capabilities. It suits small and developing companies. How Much Do Payroll Companies Charge?